Coverage Types are nothing but a lookup which holds information related to the type of coverage. It just gives a reference in Coverage template that what type of coverage you are going to create. Navigate to Service Contracts Manager -> Setup -> Service Offerings -> Coverage Types. Enter a name for the coverage type, like Platinum. Optionally Enter a description for the coverage type. Enter the importance level (numeric value). In the Coverage window the importance level automatically appears, after the Coverage Type is selected. This is the most important setup that you do, without this we cannot make service contract to work. The coverage template let organization do decide what service offering you are going to offer. 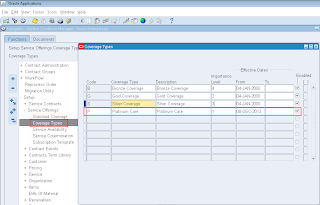 A Standard Coverage template contains attributes that are associated to a Service Item in Oracle Inventory. It provides key information on how service should be carried out on products covered under the contract. For each business process covered, it defines the times of coverage, days of coverage, reaction and resolution times for a service request, preferred resources, and the discounted rates that would be applied when work is performed on covered products. You can use Standard Coverage to define warranty inheritance rules and transfer rules. You can also link a Preventive Maintenance (PM) program to standard coverage, which includes the schedule to perform a particular set of activities, such as changing toner in a copy machine. Note: The preventive maintenance schedule is created in a manner similar to the billing schedule. Multiple maintenance streams can be defined for a preventive maintenance program and is part of Oracle Complex Maintenance, Repair, and Overhaul. Price List (Optional - Advanced Pricing) - Only required if you want to enforce specific price list for a business process. Resource Types (Optional - TeleService) - Only if you want to use specific resources. Resources (Optional - TeleService) - Only if you want to use specific resources. Billing Types (Optional - TeleService) - Only if you want to have specific pricing. Billing Rates (Optional - TeleService) - Only if you want to have specific pricing. Preventive Maintenance Program (CMRO) - Only if preventive maintenance is implemented and used. Navigate to Service Contract Manager -> Setup -> Service Offerings -> Standard Coverage. Name - Enter the name of the coverage. Type - Select the type of coverage such as Platinum, Gold or Silver the LOV which you already defined in Coverage type lookup. 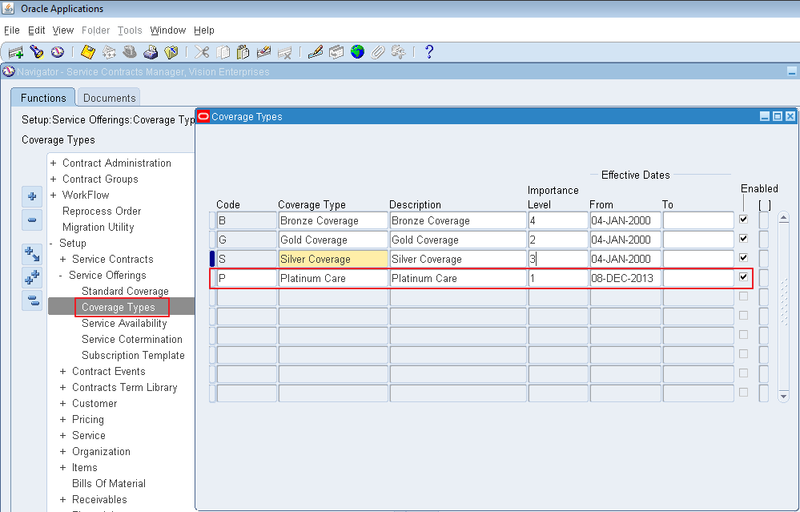 Once you select coverage type the Importance Level field and start dates for the Effective Dates fields are populated. Description - Enter a brief description for the coverage. Exception - If you need an exception coverage then add an exception coverage for the standard coverage. For this you have to first define an exception coverage template. Suitable as Exception - Select this check box if you want to use this coverage template as an exception coverage for other coverage templates. Notes : You can add a note the coverage template by clicking the Notes button. Warranty - If the coverage template is going to be used for warranty contracts then select this check box. Inheritance - Applicable only if Warranty check box ix checked. It allows the warranty to continue if the product is replaced. Select one of the following values based on business requirement. Remaining Duration - Remaining Warranty will be transferred to the replaces product. Full New Duration - Replacement product will have fresh warranty duration. Its just like warranty of a new product. Note: The Warranty check box can be updated. Only, if an Inheritance has been entered in conjunction with the Warranty check box, then Inheritance must be set to NULL before the Warranty check box can be unchecked. Synchronize Date Installed - Select this check box, if you want to set the warranty start date to be the same as the installation date set in Install Base. If this check box is checked then changing Install Date in Install Base will change the warranty dates considering there is no Service Request / Repair Order opened against the item instance. In order for this feature to work you must confirm that in Status and Operation setup, the Active status is checked for Update Online within the Warranties/Extended Warranties category. Free Upgrade - Select this check box if you want to track this coverage as having a free upgrade. This flag does not provide any automated functionality at this time. Transfer: Determine the status of the contract in case a customer device/product is transferred from one owner to another. No Change - There would not be any changes in the existing contract associated for the serial. Terminate - The current contract subline is terminated. The termination date would be the transfer date. No new contract is created for the new owner. Terminate If Not Related - If the new owner is related to the current owner of the contract then no changes are made to the contract. If new and old owners are not related then the contract is terminated. The termination date would be the Transfer date. No new contract is created. Transfer - The current contract subline is terminated with the Termination date set as Transfer date. If the Contract Transferred is a Warranty Contract, then a Contract for the new Owner is created in Active Status. If the Contract transferred is an Extended Warranty or Service Contract, a contract is created for the new owner in the status defined by the profile option OKS: Transfer Status. This will generate credit to old owner on pro-rate basis and an advance one-time billing schedule to generate invoice to new owner. Transfer If Not Related - If the new owner is related to the current owner, no changes in the contract. If the owners are not related, the current contract is terminated and a contract for the new owner is created. If the contract transferred is a Warranty contract, then the new contract is created in the Active status. If the contract transferred is an Extended Warranty or Service type contract, the status of the contract would be defined by the profile option OKS: Transfer Status. This will generate credit to old owner on pro-rate basis and an advance one-time billing schedule to generate invoice to new owner. Preventive Maintenance - You can select a Preventive Maintenance schedule that will help to provide the preventive maintenance service using Oracle Complex Maintenance, Repair, and Overhaul. Business Process - Its a 'Service' entity that determines what all types of Service Requests are entitled to get benefit of Service Coverage. Offset Duration - Offset duration is like a tool that allows you to differ the services for business process. For example, set field support to start one month after the contract comes into effect (to achieve this have 30 in offset duration) and set online support to be available immediately. Since you want online support to start immediately no need to enter any values in offset duration. Offset Period - It specifies the unit of measure for the offset duration which you entered in earlier column, like hour / day / month. If the Offset Duration is modified, the Start and End dates are automatically adjusted as long as they're within the range of the service coverage dates, and conversely, if the Start and End dates are modified, the Offset Duration is automatically adjusted. Price List - Choose a price list if you want that to be used while billing the services when a business process used in service request. Discount - Select the percentage of discount that is allowed for business process, like 5/10%. Timezone - Choose a Time zone from the LOV. This is required to determine if the service request can be served now or not. You can define more than one time zone for each business line. However, you must define at least one time zone for every business process line. Default - Select a default tim zone for the selected business process. Start Time - Select the start time which determine the start time of service on a particular day. End Time - Select the end time which determine the end time of service on a particular day. Days Check Boxes - Select days check boxes to determine which time is applicable of which days. For a given business process, the coverage time for at least one day must be entered. You can enter multiple coverage times for a specific time zone. You can also define multiple coverage times for the same day, as long as the coverage time records do not overlap. Always Covered - You can click the Always Covered button, to set to set the Start Time and End Time for all days to 00:00 and 23:59 respectively. It makes job easy if you want to offer 24x7 services. Severity Name - Enter a name for the severity definition, for example, Critical / Important. Severity - Select the level of severity, for example High / Medium. Workthrough - This check box overrides the normal coverage times for a business process. For example, suppose you have support between 9 a.m. and 5 p.m. from Monday through Friday with a two-hour reaction time. If a customer calls at 4:45 p.m. in the middle of the week and Work Through is selected, then the customer is entitled to receive support by 6:45 p.m. that evening. If the Work Through option is not selected, then the support representative has until 10:45 a.m. the next morning to respond to the call. Active - It indicates this severity level is active and makes the reaction times available through an entitlements call. Reaction Times for days of the week - Enter specific reaction times, in hours, for each applicable day. For example, if 2:00 is entered in the Monday field, then a service call must be made within two hours if the call occurs on Monday. Workflow - Select the applicable workflow for each reaction time name specified if you want to execute to a workflow to automate some business function. Severity Name - Pulled from the Severity Name on the Reaction Times tab. Severity - Pulled from the Severity on the Reaction Times tab. Workthrough - If selected, this check box overrides the normal coverage times for that business process and serves the same functionality as described above in Reaction Times Workthrough. Active - Indicates this severity level is active and makes the resolution times available through an entitlements call. Resolution Times for days of the week - Enter specific resolution times, in hours, for each applicable day. For example, if 4:00 is entered in the Monday field, then the issue must be resolved within four hours if a call occurs on Monday. Type - Select a resource type from list which you like to be included/excluded when a service request is logged against this contract. For example, Engineer / Supervisor. Resources are defined in CRM Resource Manager. Name - Select a resource from the list. Classification - Select the proper classification for the resource. You can classify a resource as Preferred, Primary or Excluded. If you classify a resource as Excluded, the Assignment Manager removes the resource from the list of available resources while resources are assigned on service request. Service Activity Billing Type - Select the billing type from the LOV. Duplicates are not allowed. If the billing type is Labor, then the Billing Rates button is enabled. Up To Amount - Enter the maximum allowed amount. If you leave this field blank, the upper limit is restricted by the percentage covered or discount you enter in the % Covered field. % Covered - Enter the percentage covered or discount. For example, if new parts have been installed to fix a problem at a customer site, the bill for the work needs to be calculated, taking the coverage on the service contract into account. If parts are covered 50% up to a maximum of $300, and the charge for parts was $800, after applying the rates agreed on the contract, the charge would be calculated as $500, after the maximum discount of $300 has been applied. For the same contract rates, if the charge for parts came to $500, the customer would receive the full 50% discount ($250) because the discount is below the $300 maximum. The bottom line is customer will receive the discount which is minimum between amount / % covered. Allow Full Discount - This check box provides 100% coverage for warranties without requiring setup of billing types. If unchecked on the template, the box will be grayed out on the contract. Any bill types data populated on the template will override the use of this check box. Billing Rates - Check this button to open the Billing Rates form to define billing rates.